I've been using this foundation for years so I think it's only fair that I review it. 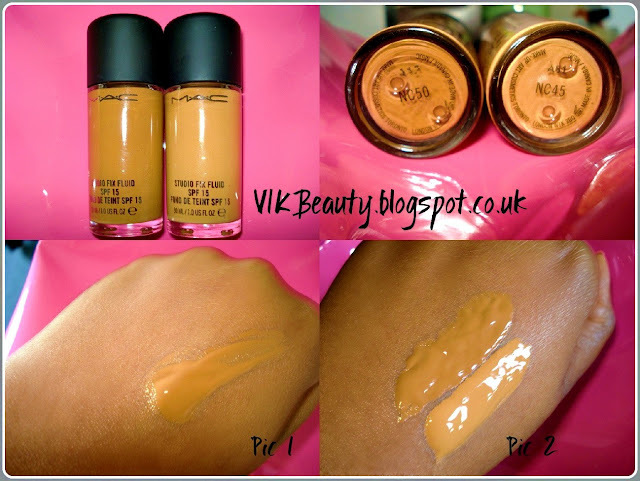 The MAC Studio Fix Fluid Foundation is a great rich foundation covering all imperfections and any redness you may have on your skin. It gives medium to buildable coverage but isn't too heavy. I find that once it has been applied it gives a natural matte finish. It is long wearing and lasts for up to eight hours. However, if like me you have oily skin, this matte effect doesn't last very long. You also definitely do not need to apply concealer if you are using this foundation. The foundation is oil free and contains soft-focus powders which gives it that smooth look. It really applies easily onto the skin. I have never been able to find the exact match for my skin tone with their selection of shades, so I mix the NC45 & NC50 foundation to achieve my exact match. I guess the good thing about mixing both shades is that for instance, as I've been in the sun recently, I've become darker so I am able to use the darker shade (NC50). From the pictures, it's clear to see how rich the foundation is. I absolutely love it. The one negative aspect I find is that it doesn't smell that nice in comparison to some other brands. I read a few reviews that this foundation made them breakout, but I have been using this for years and have never had it cause a breakout. I guess it all depends on your skin type. As this is oil free and has a matte finish, I wouldn't really recommend it to someone with dry skin. What is your favourite foundation? Do you use MAC? It's interesting because I tried this foundation and I found it didn't last long, faded and went patchy and oxidised a load really quickly! I've never tried MAC before. It looks like the foundation has a really nice structure. One you can blend easily and feels comfortable wearing. Am I right? I use this foundation and I absolutely love it. It's give great coverage and lasts all day. Definitely great for oily skins. @Hannah ~ That's interesting as I have never experienced that. I think it also has alot to do with skin type. @Sal ~ Yes it does blend easily. It is very rich! @Julie ~ It's great isn't it! I actually loved this foundation. The only reason I stopped using it regularly is because I prefer a bit less coverage now. But it never broke me out or anything only thing is I did tend to get oily relatively quickly. @Sharon ~ Yes I've heard people say it caused breakouts, but it was ok for me. I think it all depends on your skin type! @Nia ~ Yes it is a full coverage foundation and may be to heavy at times. It all depends on the look you're trying to achieve! Do you have oily skin? I do, so that it why mine tends to get oily. I haven't used a MAC liquid foundation in a while but I should definitely go back into it...I love matte finishes cause ya'know a girl cannot have oily skin all the time. LOL.